Well, my theory is that the setting in which you consume food is very important to the enjoyment of said food. Sure, I could eat a cold bratwurst while standing alone next to my car in a barren parking lot during a freezing cold day and still enjoy it. But let me paint a different picture for you. I pull up to one of my favorite golf courses in the world on a beautiful summer day and I’m really hungry – with about 45 minutes to kill. Enter a fresh sleeve of Callaway golf balls and a nice blue mini Sharpie, perfect for putting my personal mark on each ball. Throw in the comfortable cushion of a golf cart, a Gatorade, and two Advil. That, my friends, is called relaxation. Doesn’t this picture just scream the “perfect atmosphere for eating brats?” Isn’t your mouth watering for the taste of a fine encased meat? I’m with you. Good call. Notice the lightness of color in this brat. 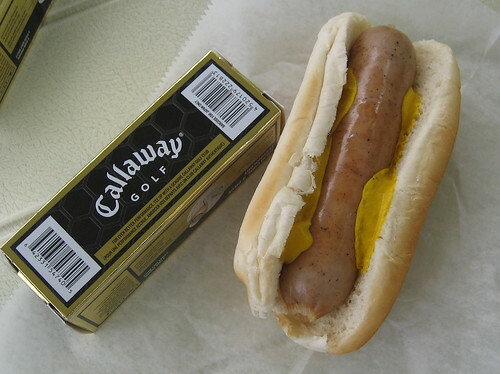 Growing up, brats were always the “white hotdog.” I was sort of afraid of them. But then I tried one and I was smitten. My dad owned a grocery store for most of my developmental years and I remember when the guys in the meat department would wrap the brats in foil and warm them up on the heated meat-wrapper contraption. Wow, memories. The multi-meat aspect of the brat is probably what gives it the color. It seems that they often have some veal and/or pork in them, so that differentiates them color-wise from the standard all beef hotdog that Chicagoans find so delectable. But I think the sausage-like texture and the spicier flavor make the brat a more enjoyable tubular meat for me. Unfortunately, Village Links kicked me in the teeth this day and I barely survived. It’s a great golf course though, I still love it and still had a great day. Posted in food on 2007/07/23 by John.